A New Jersey family had an unexpected visitor drop by for a swim on Sunday. Joan McNeill was sitting out in the yard of her home in Mendham preparing to do laps in the pool when she suddenly realized someone - or something - had beat her to it. 'I was out sunning myself, getting ready to swim my laps and I just happened to look over,' she told Pix 11. 'I ran into the house and all I kept saying is: "The bear! The bear! The bear! He's in the pool!" Joan's husband, Ron McNeill, quickly ran to grab his iPad and started filming the strange sight. The couple's home backs onto quite a thick bushland. While the two say bears are common in the area, they have never heard of the animals swimming in pools. 'It's not totally uncommon to see a bear, but it is very uncommon to see them making themselves at home and swimming in your pool,' Mr McNeill said. He added that the bear was swimming in the water for between 10 and 15 minutes, before slowly climbing out. That's when Mr McNeill decided to go inside the house. 'When it decided to come out the shallow end, I retreated back into the house, needless to say,' he said. 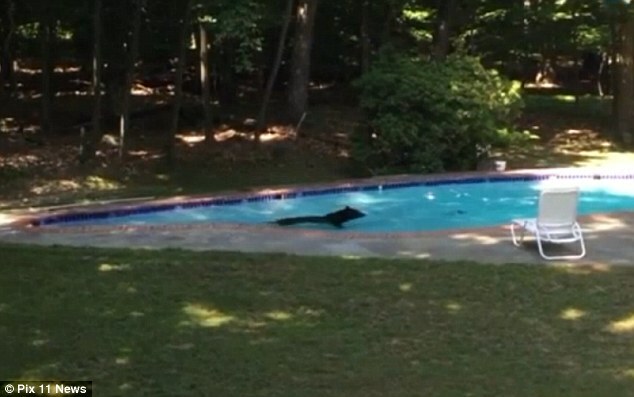 Responses to "300lb black bear goes for a dip in New Jersey family's backyard pool "